School brochure printing is essential to advertise your courses and promote your state-of-the-art academic facilities. With a great design and creative format, your school will be the talk of the district. Whether it’s to attract future students about your academic programs or inform visitors about your rich history, school brochures can make your school promotion as easy as 1-2-3. Here at PrintPlace, we print school brochures with only the highest standard of quality. We offer a wide range of printing options guaranteed to bring the best from your school or college brochure project. Our school brochures are available in several sizes including the popular 11” x 8.5” brochure. Choose from 9 folding options including the standard trifold brochure. Want to get your school brochures soon? Our school brochure printing is available for same-day turnaround. If you want to print brochures in custom sizes and options, call our print experts or fill out our custom order form. 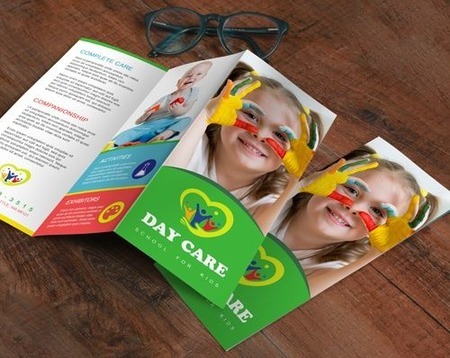 Our school brochure layout templates will ensure your artwork meets requirements for printing. These templates show guide lines so that your artwork would print out properly. School brochures are one of the best marketing tools in your arsenal. To be effective, you need to have a creative design combined with quality printing. Here are some essential elements that you need to include to make a good college brochure design. School Name and Logo - Your logo is at the heart of your identity as a school. You need to put your logo prominently in your school brochure. The best place to display your school logo is on the front panel of your brochure. History, Mission & Vision - Students, parents, and school visitors need to know your school’s history and core values. This will help them assess if your school is a perfect fit to their educational needs. Academic Programs - If you want to feature the courses you offer in detail, take advantage of your brochure’s inside panels. Calendar of Events - This will give your recipients an idea on what to expect should they decide to enroll to your school. Contact Information - This includes your telephone number, email address, and website. You may also include the contact information of school administrators. This data is perfect for the back panel. Call our friendly print experts to learn more and start to print school brochures now.